This hand-made pair of copper wire-work earrings are inspired by sea lavender, a coastal shrub with beautiful purple and white flowers. The amethyst and fluorite gemstones compliment the oxidised copper detailing perfectly, following a gradient of colour from deep purple through to translucent lilac. These earrings are just perfect for those who love spending time at the coast. To wear, the circle shape sits side onto the ear/face. This rustic pair of droplet earrings are inspired by the earthy green colours found in the depths of the forest. The surface has been layered with a green verdigris texture that creates a Bohemian style of weathered jewellery. For all woodland spirits, forest dwellers and lovers of leafy walks out there. Delicate polished copper earrings with a leafy woodland design. Hand crafted with moss agate and moonstone semi-precious gem stones. Reminiscent of rain drops dripping off a leafy branch, we love how the colours of the watery moonstone and the deep green agate combine. 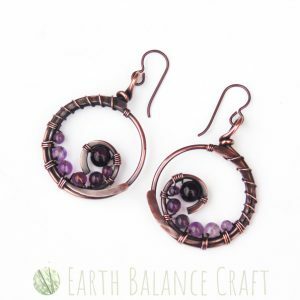 This pair of dangling copper earrings feature a rustic copper leaf with a garnet gemstone. The design is inspired by the colour of Victoria plums, a rich palette of mahogany purple reds, so luscious! The little copper leaves have each been hand cut, weathered and polished which gives a warm rustic finish. A dainty pair of oxidised copper wire earrings featuring vibrant orange/red agate and carnelian beads. The elven style is inspired by the depths of an autumnal forest scene, with crimson colours of falling leaves. The dangly style of earring droplet sways gently with movement complimenting the jaw line and neck. A delicate copper wire leaf design with dreamy moonstone, labradorite and prehnite semi-precious gem stones. These earrings are inspired by the beauty found in tree leaves, picking out the tones of a leaf caught by a stream, with gentle droplets of dew from an early morning mist. We love the watery essence of this design, capturing the essence of nature. These tiny hand-made copper earrings feature a delicately wire wrapped hessonite garnet stone. The minimal micro scale design is inspired by late summer when the hedgerows are filled with ripening brambles and berries. An earthy style of copper wire earrings featuring moss agate and brown agate semi-precious gemstone beads. With rich woodland colours of deep brown and forest greens set against the polished metallic highlights. The style draws inspiration from ancient tree lore, trees that have stood calm and strong for thousands of years. This pair of elven styled hand-made earrings are part of a set with our ‘Moss of the Woods Necklace‘. This pair of dangling copper earrings feature a rustic copper leaf with a watery yellow citrine gemstone. Inspired by our love of woodland and forest, hearing the rustle of wind through summer trees like a gentle melody. This design is both contemporary and Bohemian in style. The little copper leaves have each been hand cut, weathered and polished which gives a warm rustic finish. 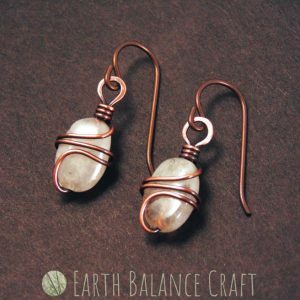 These tiny hand-made copper earrings feature a delicately wire wrapped rainbow moonstone. The minimal micro scale design is inspired by late winter, when snow drop buds begin to bloom in the forest, symbolising the earliest signs of spring and the return of life to the earth. This pair of feather inspired drop earrings are inspired by the majestic male peacock. The design is hand-made with delicate copper wire work and adorned with zesty lime green peridot and aqua quartz gemstones. The shape follows the contours of the peacock feather eye.